About the four of us! 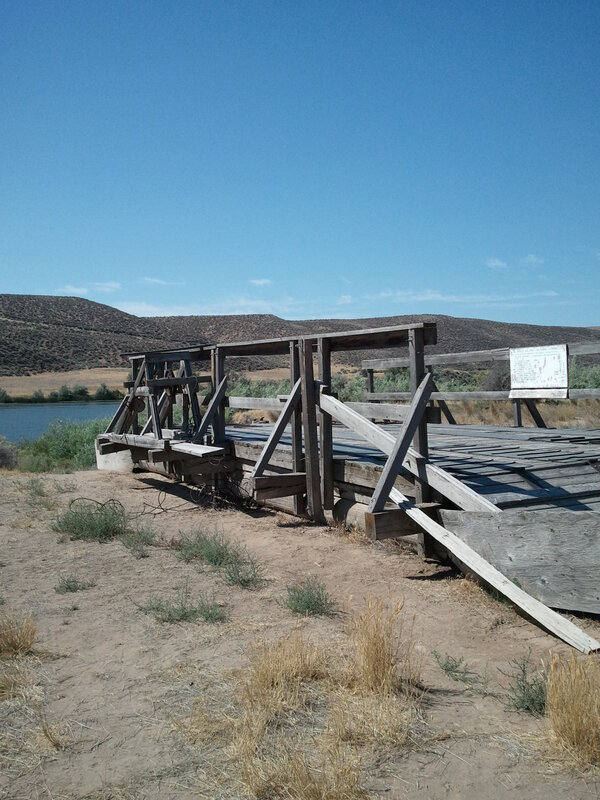 The pioneers traveling the Oregon Trail in the 1800s came to cross the Snake River at this location. In July & August the water level drops to about 3-4 feet, enough they could ford the river using the islands to reduce the hazard. In 1869 Gus Glenn built a ferry to expedite his shipments of goods for the people out west and he could also take 2 wagons across at a time. Many settlers used this method if they had the money. It cost $1.50 for a team and wagon. 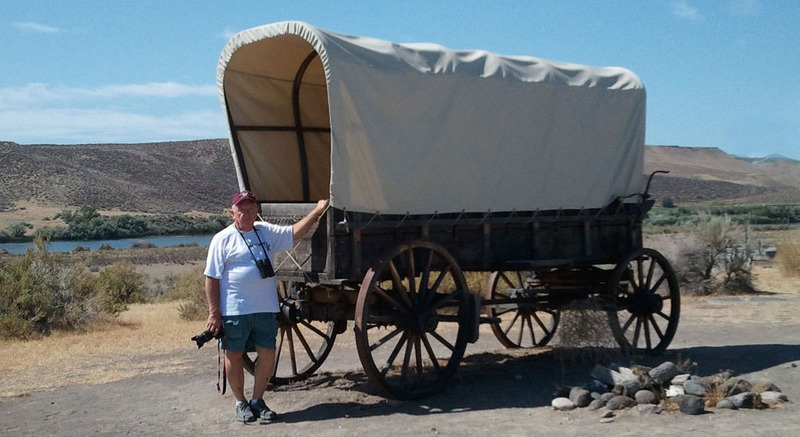 We visited the Oregon Trail Interpretive Center within the park and got pictures of the covered wagon and ferry that is preserved here. Great stopover! Only drawback is it is hot, had to run the air conditioner for the first time in 2 weeks. But guess it is going to toughen us up for the trip home as it has been over 100 every day since we left. The next morning we did a few chores then drove into town past the Carmela Winery which is a really pretty place and has a good restaurant but wanted to see what Glenn’s Ferry did for their annual celebration which was this weekend. Pretty small town but fairly clean! Went into the local pub and had a small burger for lunch. Couldn’t believe they serve frozen French fries in the land where Idaho potatoes are raised. Outside the stores and eateries on the main street are many decorative benches done by local artists. After lunch we went back to the park and took a long awaited nap! Once in Boise we left onto I-84 heading southeast. 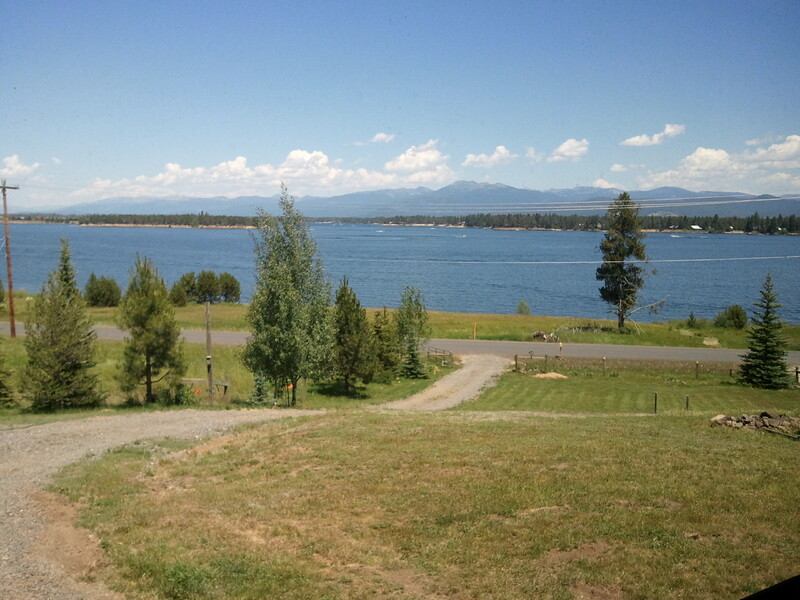 We decided to stop for the night at Glenn’s Ferry, ID and stay at Three Island State Park. Wow, is this an oasis in the desert! They irrigate this park using water from the Snake River and have nicely mowed green grass, huge sites, level parking and big cottonwood trees. So we booked an extra night! 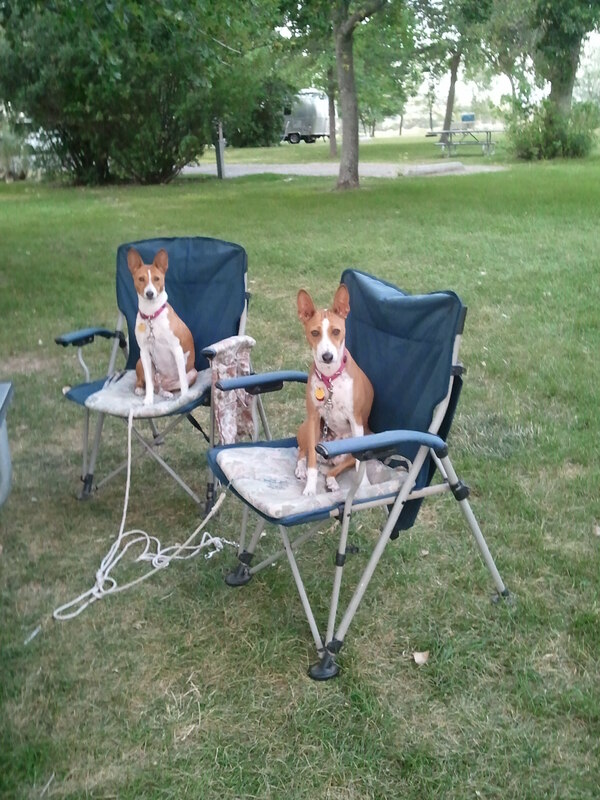 And the girls enjoyed sitting in the shade like princesses! The next morning July 24th, we decided to forego taking Hwy 55 north from Boise through Eagle as parts of it are known as Cardiac Canyon (narrow with rock outcrops and along the river’s edge), and instead we drove up Hwy 95 along Oregon border through Cambridge and McCall then down to Donnelly, our destination for next few weeks. Big mistake, as once again they are doing highway reconstruction so we had to drive almost 12 miles in one lane of gravel behind a pilot car to get to pavement again. Cough, cough! Stopping in McCall at Ridley’s Super Market we stocked up on food and ice for next few days. We have friends who have a place on the side of West Mountain in Donnelly and they are kind enough to ask us to stay for awhile. They have shared sewer, water and electric and in exchange for this we are planning to help them with some long planned construction projects while here. Our rear window looks over Lake Cascade and the guys are planning to fish several days. Not a bad deal and best of all it is cool here. Highs in low 90s and lows in the 50s make it better than Dallas in the summer. Located just up the hill is Tamarack Resort area, a planned ski and residential community waiting on the housing market to come back to be completed. 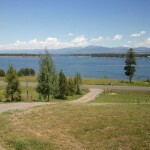 So far it is very nice with many large log homes, ski lifts and lodges already done, some homes as much as $5 million. 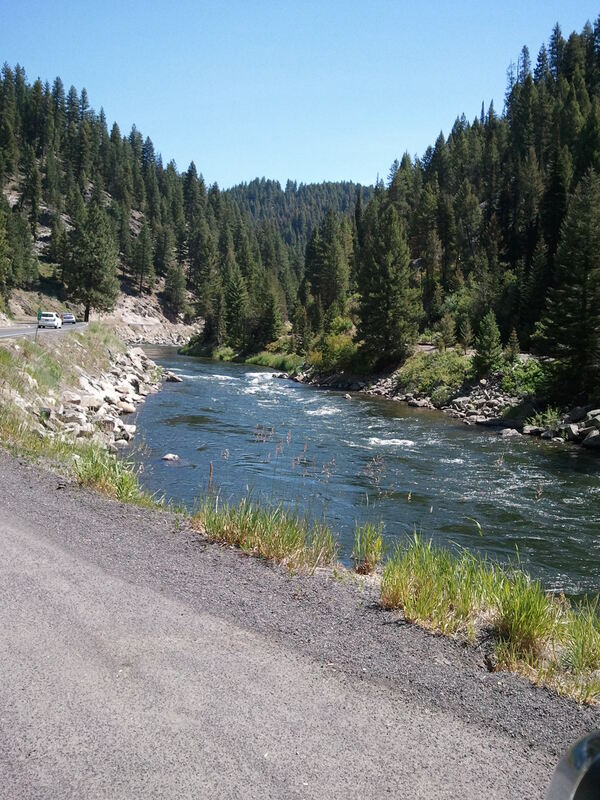 On Tuesday morning July 23 we headed north up Hwy 84 into Idaho. Now this is where we really see High Desert! So rugged there are no rest areas for hours and what few they had are now being used for highway construction crews to park equipment and paving products. You drive for miles without seeing anything but small rocks and sage brush then all of a sudden you see green fields of corn, potatoes and beets. Using irrigation from the Snake River these people are able to turn the area near Heyburn and Burley into profitable land thereby building dairies and cheese factories and businesses to support it all. We made a quick stop in Heyburn at a Pilot truck stop. What a mess it was around the edges from the trash and wind. We were ready to leave quickly as the girls had to tip toe through the stickers!! 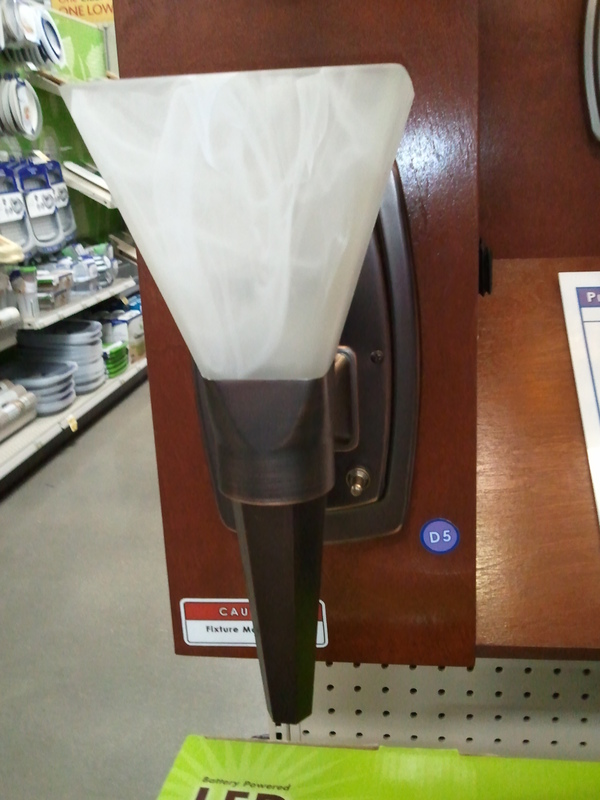 So we proceeded into Boise, ID with a quick stop planned for Home Depot. 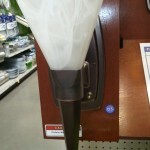 We could pull alongside the building for shade and out of the way while we went inside to get supplies for our next project. Then we drove on to Camping World on the west side of town. 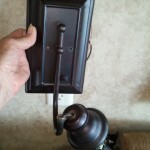 Here we were able to pick up new lube plate, water pressure regulator and order new wall lamp. The one we have has broken twice from motion stress and the Leader has repaired two times, now it is being replaced with different style. Another Chinese product to recycle! And shame on Keystone as it is not a cheap fix! Thankfully we decided to bypass Boise for the night and drive in to Caldwell. 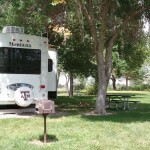 Here is where we found maybe the First Place winner in our RV park search. 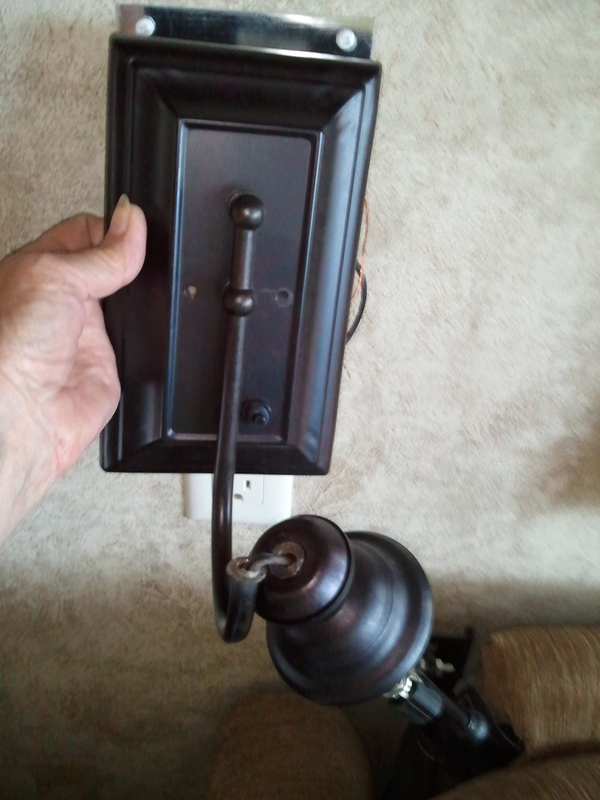 The folks at Ambassador RV Park have done it right. 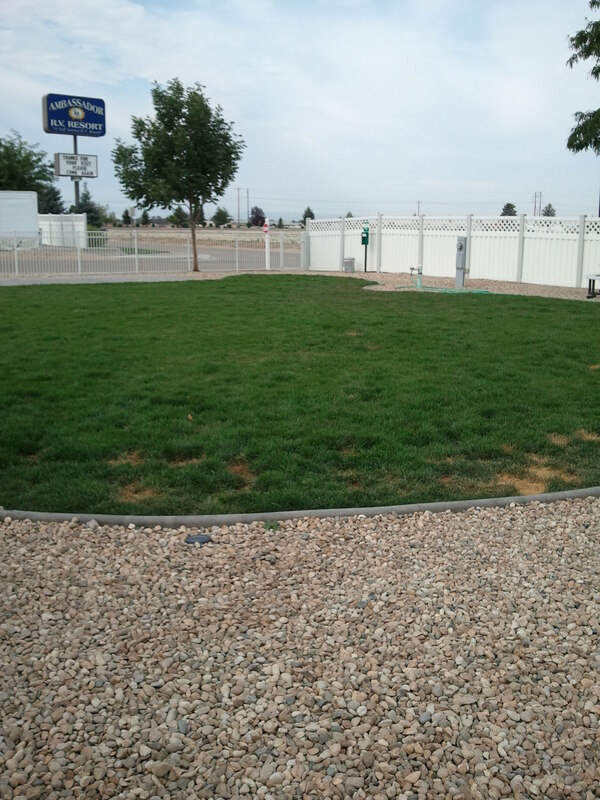 Wide paved drives, graveled parking areas 80 ft long, concrete patios with grass lawns, 50 amps, and a wonderful fenced Bark Park with green grass and graveled areas. 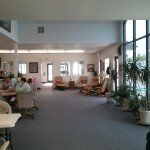 They have 180 spots and some full timers but the layout is well done and very clean. Laundry even had air-conditioning and TV. 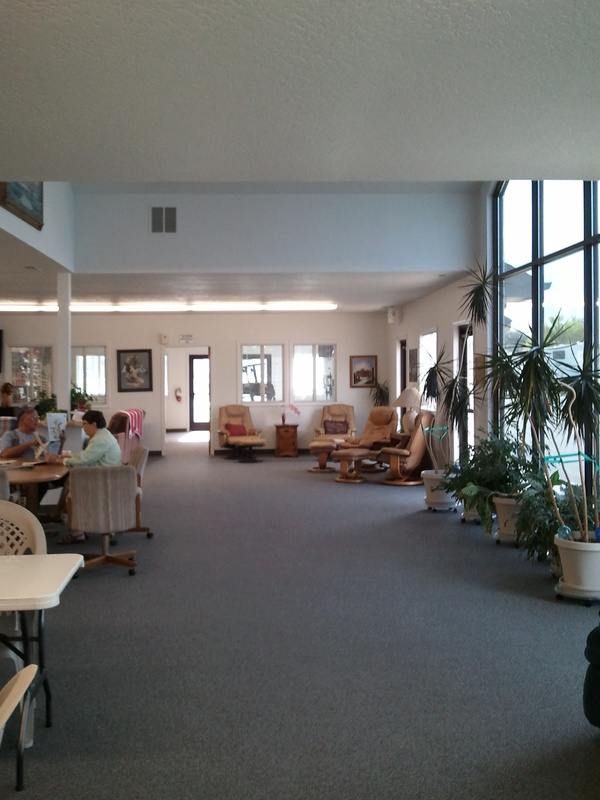 The club house was beautiful and had a full kitchen making it ideal for groups traveling together. We will be back here for sure. Monday July 22nd we left Rawlins driving through Rock Springs and into Utah. We drove on the eastern route into the Ogden area thereby by-passing Salt Lake City and its traffic on I-15. Saw some great scenery as we came through the canyons and into the Wasatch Valley. As arid as this area is they have utilized irrigation from the reservoirs built to capture water from snow melt and runoff. The Mormons realized the potential of this area when they arrived in the 1800s and everywhere you look are farms and orchards. 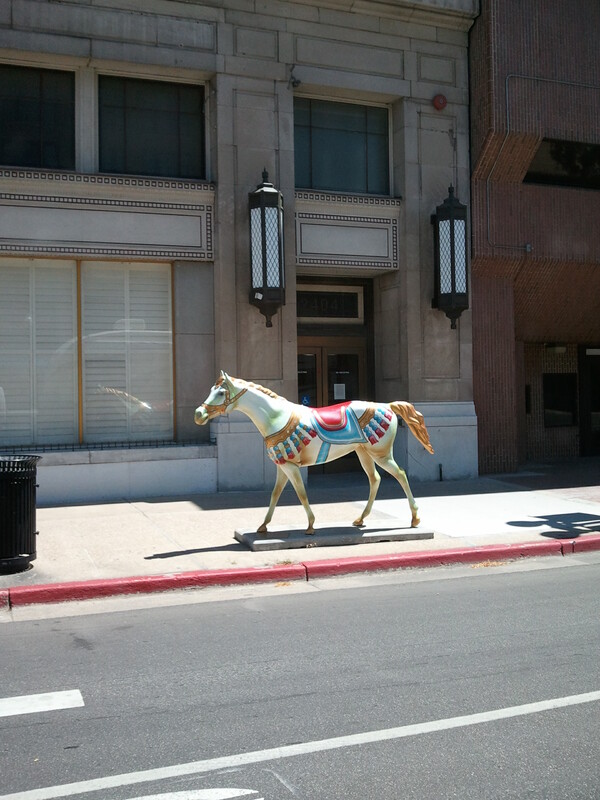 Our Rand McNally RV GPS unit routed us up the main street of Ogden (Hwy 89 north) and we saw many of the painted ponies on every corner and shown here. 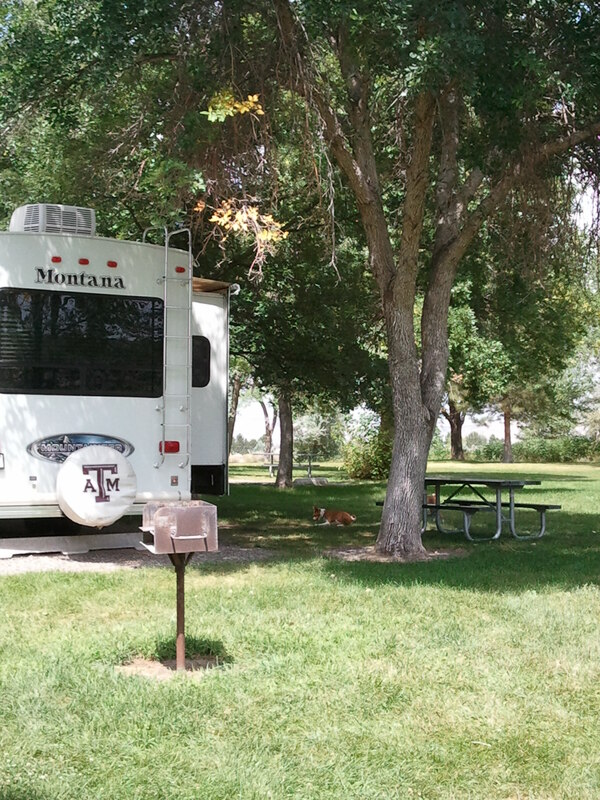 We headed to Perry, UT and pulled into the KOA there. Not usually our choice but this one was located off the main highway, quiet, small and easy to access. So we got a premium spot pull thru with 50 amps and a large concrete patio and wooden table, chairs, and swing. Grass for the girls shaded by big trees and no wind made it a good choice. We set up then drove 2 miles up the road and bought some fresh fruit. After that we got a burger for dinner then went to the movies to see “Red 2”. Kinda crazy movie but was fun and a good break from all the driving. We were back in time to sit outside with the girls and enjoy our view of the Great Salt Lake and a good sunset. Once up and loaded on Sunday morning, July 21, we continued our journey due west. Our plans had been to stay in Cheyenne but as we drove we kept seeing vehicles with lots of bikes on the back, lots of large horse trailers, RVs pulling trailers for motorcycles and heavy traffic. What’s up?! Well, as we discovered later, it was time for Frontier Days in Cheyenne and all sorts of activities occur during these 10 days here. Not a single RV spot was available and most hotels full. Even the rest areas (few as they were) had people stopping to exercise their pets and horses. So we pushed on west heading to Rawlins, WY. 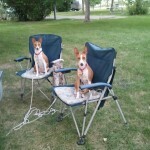 Once we arrived we were fortunate to get into Western Hills Campground with no reservation. This area is very dry and windy; we actually battled wind gusts over 40 MPH as we drove so were glad to stop. All night the wind blew and shook our rig. 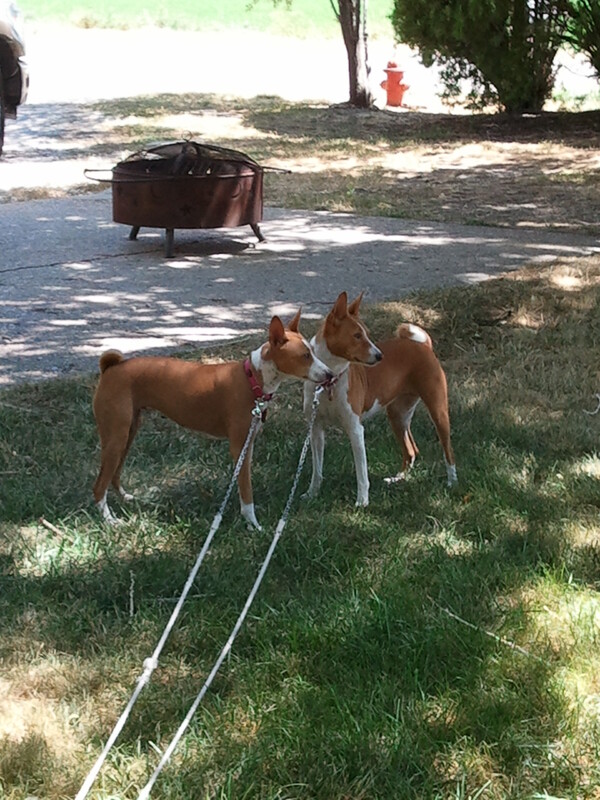 The Basenji girls had a hard time here as the entire place is gravel and hard on their feet so puppy pit stops were short and then back inside to the cool and carpet. Just west of here is the Green River area of Wyoming and the location of the Flaming Gorge Reservoir. It would have been neat to go down and camp in one of their campgrounds but had to pass it this trip. The Green River Basin contains the most massive and easily mineable deposit of trona in the world. What’s trona; you say? Well it is a mineral that yields soda ash used in laundry detergent and to make glass and paper. It also is used to manufacture soda bicarbonate and sodium phosphates. The mines here vary from 800 to 1600 feet deep in beds 8 to 12 feet thick. 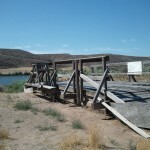 After processing it is shipped from the Green River Basin by 100 ton rail cars and trucks. Thus you can see the importance of the railroads and a great interstate highway here. The new F350 performed beautifully except our miles per gallon suffered, gaining elevation with each mile and into a sustained 30 mph wind with gust to 40 mph (That’s what the illuminated road signs reported) we still average 10.9 miles per gallon. The leader thinks that’s pretty good for towing a 14,000 pound plus rig. 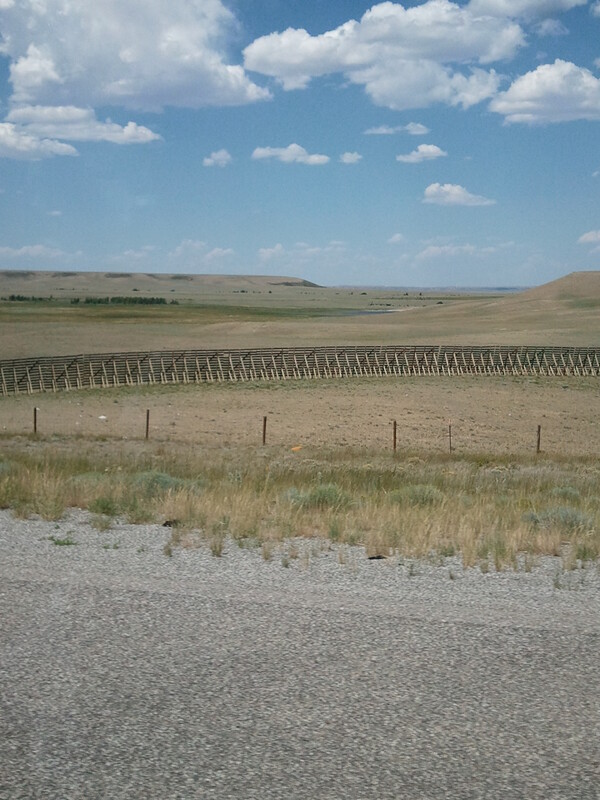 Another amazing thing we saw in Wyoming was the miles of snow fence. What is that you say? Well, up here they have large snowstorms and combined with the wind it creates a big hazard on I-80. Beginning in the 1970s when the interstate was completed they built snow fences which caused the snow to drift against them instead of the highway. Seems as if the state was granted over $4 million of stimulus money in 2006 to add to these fences and amazingly enough the company that got the contract to maintain them also was able to take the old boards and recycle them and they are sold to homeowners for exterior and interior work. 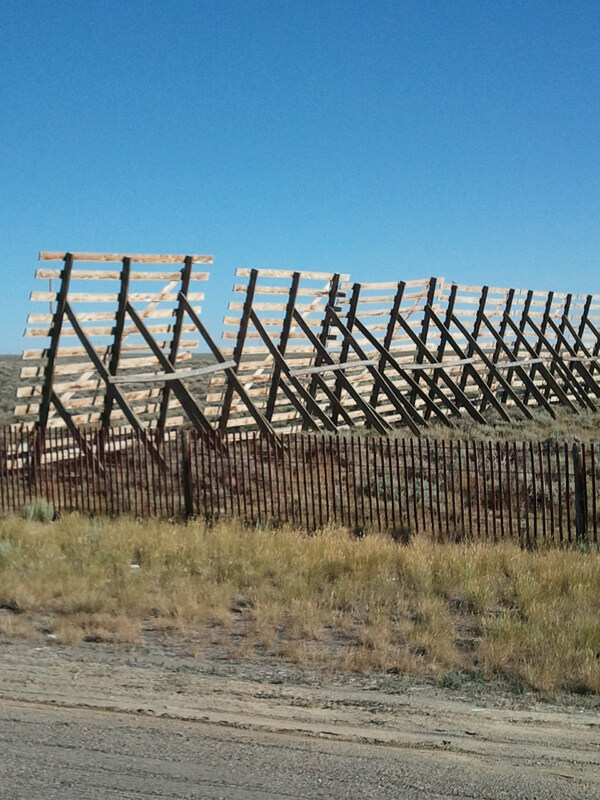 There are over 55,000 feet of the fencing along the roadway. Amazing! Here is a picture to show both the old and new style of fence. 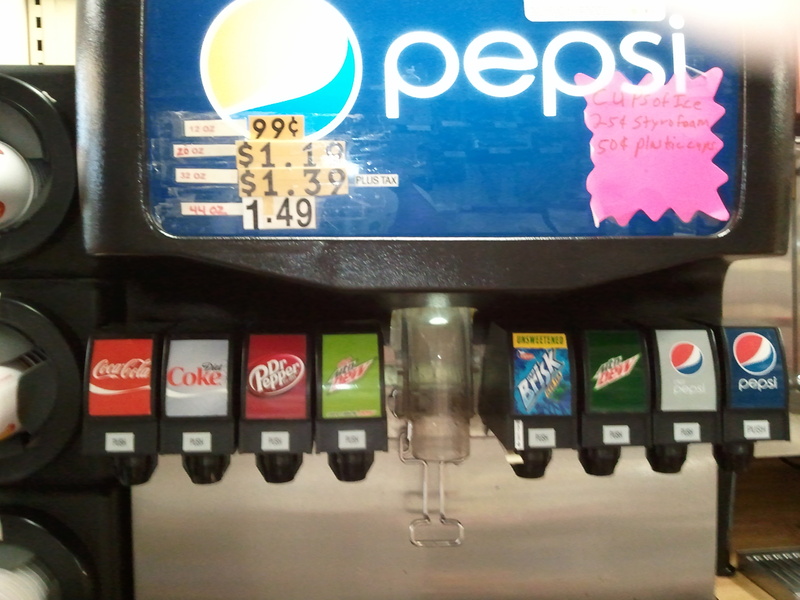 Finally a drink machine that lets you make your own choice. They have it all. Listen up Cowboy Stadium in Arlington, Pat’s Pizza in New England and all the others that try to imply that a Pepsi is a Coke. Not a good thing for a diehard Coke drinker like the Leader. We drove on west on I-80 heading to North Platte for the night. Long day of driving but we were making progress. Still hot and windy! North Platte is a railroad town and home to the largest railroad yard in the west known as Bailey Yard. This is actually part of the Transcontinental Railroad approved by Congress in 1862 but it was not completed until several years later. Buffalo Bill’s Ranch State Park is just west and his original house is located here. As we drove west it was easy to see how tough times were for the early settlers as the terrain is rough and water scarce. 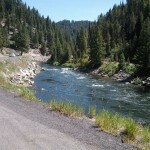 We crossed several forks of the Platte River which was a major stop for them. My ancestors actually settled in Omaha in the late 1800s then traveled to Wyoming using much this same route (minus the interstate) so we could appreciate their struggles. On July 20th our stop for the night was not a five star, but not a lot of choices here. 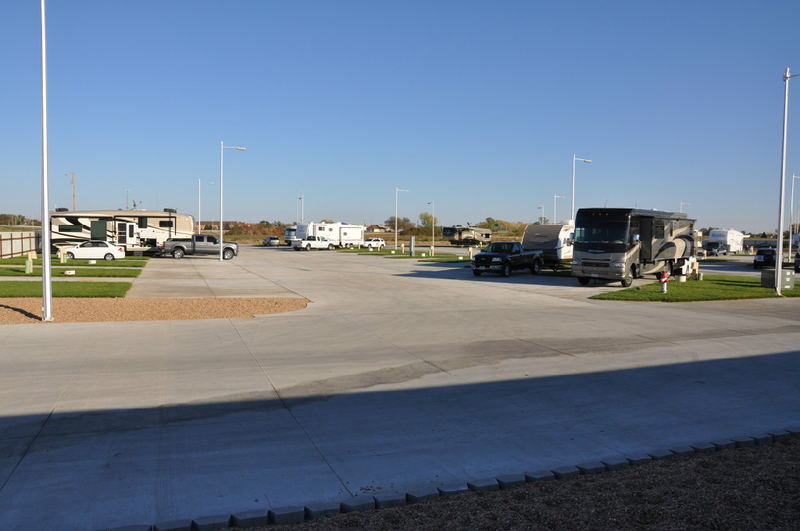 We rolled into Holiday RV Park off I-80 and checked in. Had a pull thru with a grassy area next to it and a big Sycamore tree for shade. 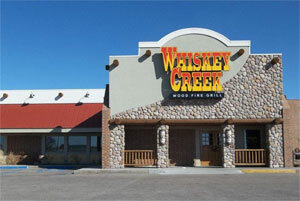 Turned on the AC units and then walked up the road to eat a steak dinner at Whiskey Creek Steakhouse. Very good corn-fed Nebraska steak! After much planning and preparation we left on July 19, heading north out of the Dallas area. This time we chose a quieter route up I-75 and onto Hwy 82 west until we connected with I-35 north of Denton heading toward Oklahoma City. Much better route and less traffic! We drove through the Moore area and witnessed a lot of the destruction from the tornados. The citizens here are doing a great job of cleanup and rebuilding. Thank goodness Oklahoma has built several nice rest areas as we had planned to drive straight through and they were a pleasant break for the four of us. 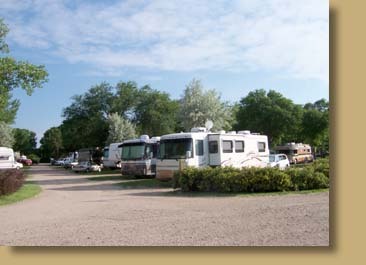 Our destination for the first night was Air Capital RV Park in Wichita, KS. What a good job they have done in planning this park. 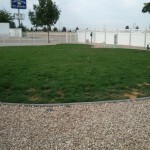 Nice drives, concrete, and green grass made it seem like an oasis! We had a large pull thru spot with 50 Amp so we could run both air conditioners; it was 103 when we parked! Wichita is the largest city in Kansas with population over 380,000 and the Sedgwick county seat. The name Air Capital comes from the fact that beginning in the early 1920s airplane pioneers like Stearmen, Cessna, Beechcraft and Mooney were building their airplane manufacturing businesses here. This continued for years and eventually Boeing came to Wichita. Even now Cessna and Beechcraft remain here and over 50 businesses in the area are still related to the aircraft industry. Many oil exploration companies are located in this area and one of the largest, Koch Industries, has its home offices here. Wichita was selected as one of the top 10 big cities to live in by CNN and Money Magazine in 2006. Great town and perfect place for our stop over! On Wednesday, May 15, 2013, the four of us drove east 30 miles on I-10 into Boerne for a quick look and lunch. We parked in the historic part of town in a free parking lot then walked across the street to the Cypress Grill for a good lunch. They serve slightly upscale items with reduced portions (Note: not enough for guy tummies) but atmosphere is good and décor is neat. Afterwards we walked in and out of several antique shops but avoided the girlie shops as none of us needed glitter on our sandals or flower scarves around our necks – after all this is Texas and too hot to cover your neck in summer. Next was a quick drive down by the river to see the work they are doing on the riverside park and sidewalks. Will be neat when they finish! Boerne was founded in 1848 by Free Thinker Germans who had settled on the banks of Cibola Creek. The 1870 limestone courthouse is the second oldest in Texas and was designed by architects Zoeller and Stendebach. The Boerne Singing Club and Village band were formed in 1860 and the band is billed as “Oldest Continuously Organized German Band in the World outside Germany”. In 1998 the Federal Republic of Germany recognized the Boerne Village Band for its contribution to the German heritage in Texas and America. Always fun to listen to the Oompah music at fairs all around here! Driving west from College Station, Randy (our Rand McNally RV GPS) wanted us to drive through the south end of Austin, Texas on Hwy 290 and we’d been there and done that so we over-ruled him. Lots of traffic and being a Saturday would be worse with soccer moms everywhere and shoppers. So we drove through San Marcos and New Braunfels on Hwy 46 just north of San Antonio onto I-10 west. We made it into Kerrville and By the River RV Park by 3 PM. We ended up with a wide spot with a large Mesquite tree shading our west side so were really pleased. Good to see our friends Tom & Katherine from last year’s stay in Idaho who are work campers here. After setting up we joined them and drove into town for a great catfish dinner at Lakehouse Restaurant. They do a good job and we discovered that this used to be a Catfish King’s location so the current owners have carried on a good tradition. Afterwards we drove on Main Street (Hwy 27) east to place called the Wagonmaster where they restore and sell Older Willys and Jeep Wagoneers, known as Woodys. They do many restorations and are almost a museum for this unique vehicle group. Amazing guys who had a dream! 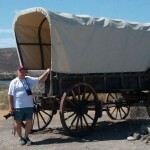 Check them out and their inventory at: www.wagonmaster.com. We are constantly amazed at the resourcefulness of average Americans. Wayne on Another Ford Vacation!